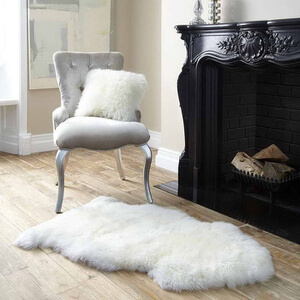 Add timeless luxury and sumptuous comfort to your home with this pure sheepskin grey rug from Royal Dream. 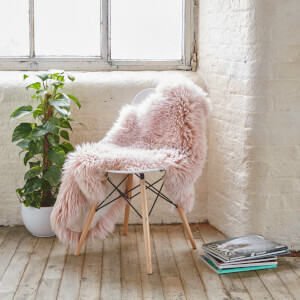 Crafted from 100% thick pile fur, the rug’s plush softness makes it perfect for running on your favourite sofa, draped over your lounge chairs, or for lying in front of the fire in a fleecy wonderland. Beautiful colour, amazingly soft & not smelly at all! Was a good present! Lovely rug, very soft. Colour true to pictures. This was a present for my sister, she seems to love it! Which is good, lovely colour & texture! Delivered in a timely manner! Great! What a lovely present to give to one of my grandchildren this Christmas. It really is attractive with long grey fur and should look great in her room. Reading the reviews I was unsure what to expect quality wise but thought i'd give it ago as it was an exceptionally low price. I purchased three grey dyed sheepskins and I think its important to point out each were different - they are a natural hide so I was expecting variation. The first, and by far my favourite was bigger than the approx dimensions stated, very long pile and very soft, colour wise it looked very similar, though slightly lighter to the images (of the hide draped.) The second appeared small and thin, very silky fine texture. colour wise the second was much the same as the first though the silky texture gave it a slightly shinyer look. The third was medium sized but so thick!! it had a more matte appearance and slightly coarser texture. Colour wise the third was the same (the texture looks similar to the photo of the flat rug) The hides come rolled in cellophane in a royal dreams oblong cardboard box, once opened the pile fluffs out so it looks much thicker. Fast despatch and delivery which I wasn't expecting with the run up to black friday. Overall I highly recommend - great quality at exceptional value! But do be aware that they will vary, in my case in texture and size, which was expected. Gorgeous thick texture and lovely shade of grey. Excellent value for money too. Will probably buy more. I am so pleased with this grey New Zealand , real sheepskin rug. It came well packaged and was delivered the next day as expected. It is a lovely size and looks brill on the floor in front of my large tv and also draped across a bean bag. It is soft and fluffy and I would definitely recommend these rugs for excellent quality and price as it looks so much more expensive.